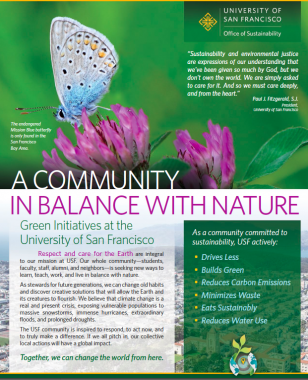 University of San Francisco wanted to launch its new Office of Sustainability, but lacked a communications strategy and collateral. Awareness of sustainability initiatives low. Created a sustainability communications strategy to guide the launch of the Office of Sustainability. Designed a green brand to support the launch. 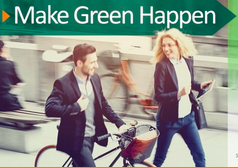 Created an interactive campaign to engage faculty, staff, and students on Earth Day. Produced two videos to highlight USF’s sustainability successes and commitment to climate action: Green Happens Here and The Beloved in Nature. Design and wrote a simple Website, created a brochure, and wrote a series of success stories. Green Happens Here incorporated into new student orientation. Hundreds of students aware of the new Office of Sustainability. Raised visibility of USF’s green successes. The Beloved in Nature presented at a meeting in Paris and highlighted in an article published on Triple Pundit.